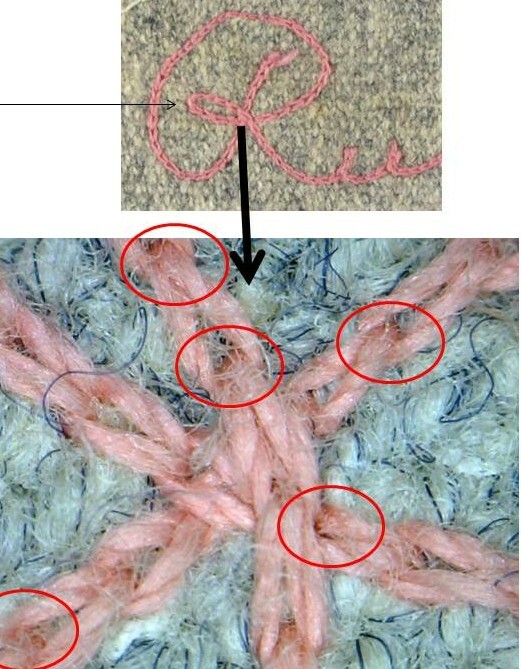 Microscopic analysis of Ruth's name stitched in the jersey's collar was a key to Grob's authentication process. 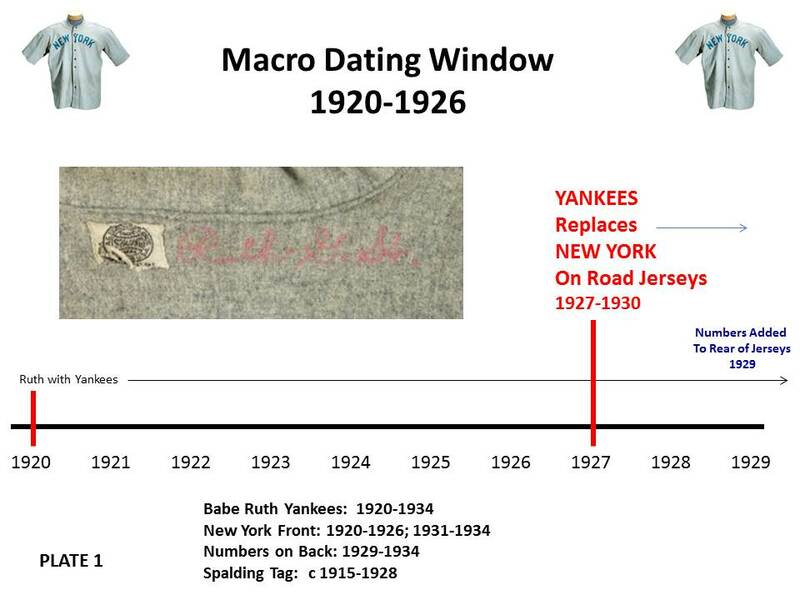 Much has been asked in recent days about the process of evaluating Babe Ruth’s 1920 New York Yankees road uniform that was sold last weekend by Sports Cards Plus for $4.4 million. On Monday, the MEARS office received a call from New York radio station WFAN asking if we would consent to an interview about my authentication of the garment. While on the air I was able to describe the evaluation process without the listeners having the ability to view the supporting images and other evidence found in the report I issued for SCP Auctions. The purpose of this article is to present some of the imagery analysis found in that report and to shed some further light on what I looked for and how it was done. To begin with, even before I took possession of the uniform, I asked that I be provided with images of the artifact. I did this so I could begin to gather references and information to support the larger effort. One of the first things I wanted to do was to try to establish when the uniform was from. 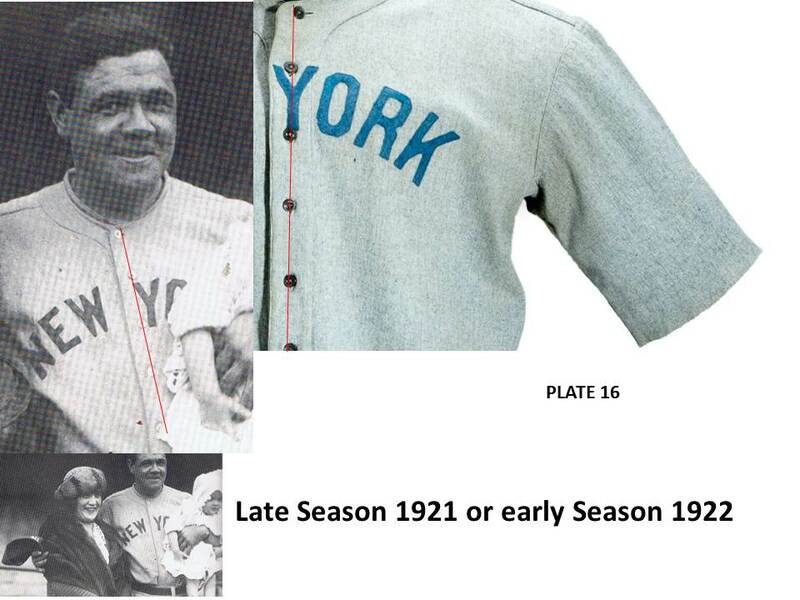 In looking at the images, I saw that the jersey was without any sort of supplemental tagging or identification used to denote the year of issuance. This is not atypical or unusual for uniforms of the period that I have researched and evaluated in the past. A combination of factors permitted a very general and initial time frame to be established and that was the period of 1920-1926. Creamer recounts actual measurements for Ruth from the period 1925-1926; most notably a chest measurement of between 43” (normal) and 45” (expanded). Given the cut and fit of uniforms of the period, I should expect to find a jersey worn by Ruth during this period to be in the size 46-48 range. The jerseys measured out to approximately a size 48 across the chest. This, too, is consistent with a citation in Creamer’s book where Ruth’s top size is identified as a size 48 (page 287). At this point in time I was comfortable with the dating and the size, but these are only issues or data points that most would consider periphery at best; but what about the garment itself? There are various things I looked for. The first of which was to ensure we were dealing with a major league quality garment. Without getting too far off track, I will spend a bit of time on the issue of fabrics from the period. The typical major league quality garment of the period was constructed of an 8oz. wool flannel. What this weight refers to is the weight of one square yard of fabric. 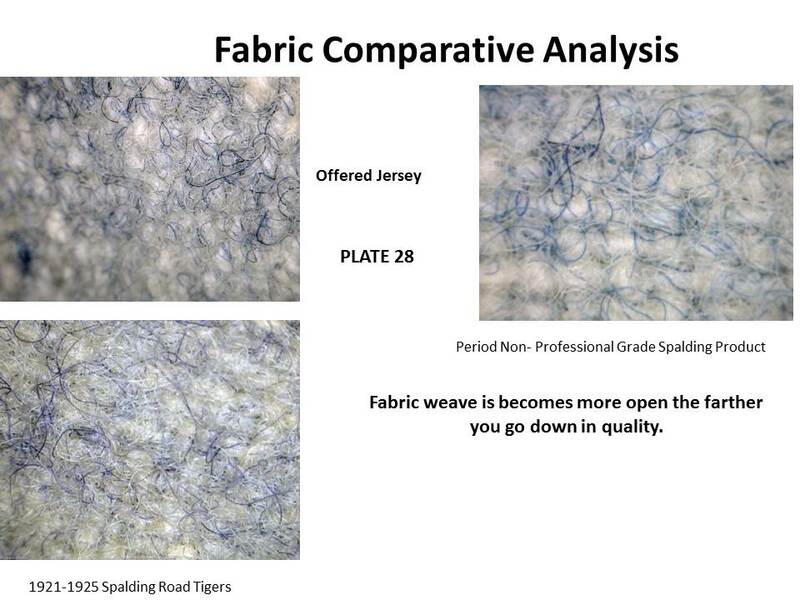 It is possible to determine the quality or grade of the fabric in an unobtrusive manner by examining the weave under a digital microscope and then conducting some comparative analysis of period products in various grades. -Font style used for the lettering. -The presence of a “sun style” collar. In short, what I am doing is creating both a physical and mental template of what “right should look like” and then I can see how the jersey in question stacks up. I found all of this to have been consistent with the overall use and wear to the jersey, which was assessed as being heavy. The heavy and consistent use and wear was found in the surface condition of the body of the garment that included soiling and staining as well as a couple of fabric repairs; most notable of these areas of repair included a 25mm area in the right rear of the collar as well as a 20mm by 20mm repair in the lower left front tail. There is also separation in the anchor stitching used to affix the Spalding manufacturers label in the collar as well as a slight tear to tag itself. None of that calls into question the legitimacy of the Spalding tag as it remained firmly affixed otherwise. The interior finishing of the joining of the front and rear panels of the garment appeared very rough in cut and construction. To me, this possibly suggested the jersey may have been taken in at some point in time. This may have occurred during subsequent use by another player or done to facilitate the fluctuations of Ruth’s weight as depicted in Cramer’s work (The index of the book contains eight (8) separate references under the heading of “weight fluctuations” (page 440). By this point in the process I had conducted imagery analysis, which supported dating and establishing of a template of what I should have expected to find. 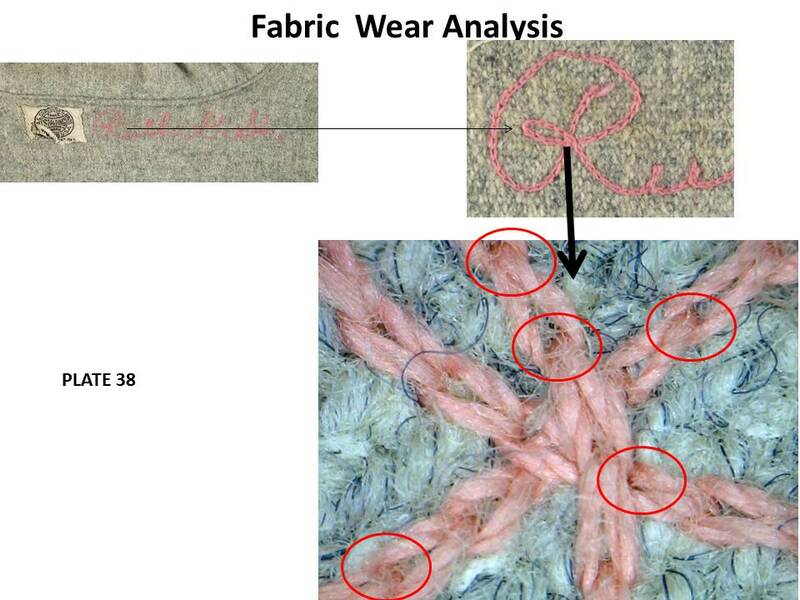 I had also conducted a detailed physical inspection of the garment that included comparative analysis in order to assess fabric quality. 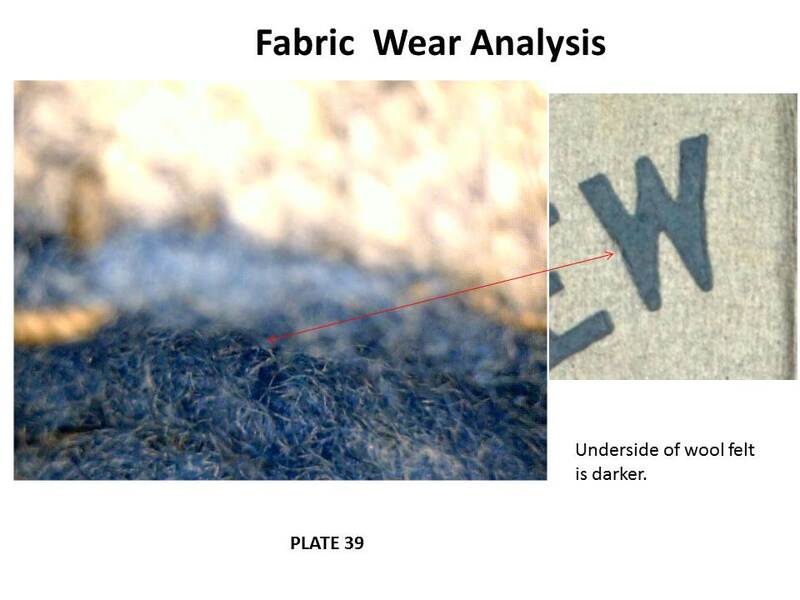 The physical inspection also focused on trying to locate and identify any signs of contrived use, wear, manufacturer, or alterations; of which I found none. It was with this body of work, information, and supporting data that I looked to form an opinion on what I thought this artifact was and why. For me, that resulted in the opinion that the jersey possessed all the characteristics that I would expect to see in a road uniform manufactured by Spalding 1920 for use and wear by Babe Ruth of the New York Yankees. Category 1: -.0 for cut/un-hemmed sleeves. 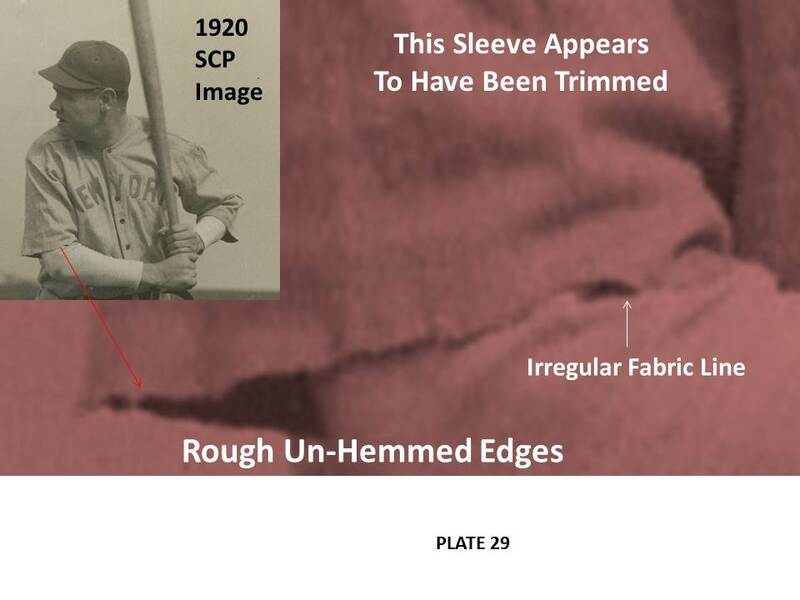 No points deducted for this because images conform Ruth wearing cut sleeves on his uniforms during the period of 1920-1922. As such, this is considered a player characteristic for Ruth during this time frame. As such, the final grade for this jersey was that of an A8. With all this information laid out, much has been said about the fact the history or provenance of the jersey has not been traced back to 1920 or even any date in that proximity. While this would have certainly been nice to have, I hope you can see that no story, no matter how compelling would have any appreciable effect on these observations and subsequent analysis. At the end of the day, the artifact is what it is and what I endeavor to do is to objectively research it and then provide a reasoned opinion based on a body of work that someone can consider for themselves. At that point in time they are free to draw their own conclusions as to what it is, or is not, and why they hold the opinion that they do. As my WFAN interview with Mike Francesa closed, Mike asked me about the cost of the work on this jersey. I declined to provide that exact figure. What I did not get a chance to explain is that the fee charged for this work is set and provided up front. The fee is the same for an opinion that results in showing a jersey as being problematic. There is never any condition or stipulation that paying the fee gets you the opinion you had hoped for. Likewise, there is never any condition or stipulation that provides an incentive or bonus if the jersey sells for a record price as was the case here. In my mind, my loyalties are to the process and the artifact in question. My hope is that this article has provided you with some insight into the process used to evaluate this uniform and how I formed my opinion. Now, that is what you call “Going Deep Into The Item To Authenicate It “good job Dave. Seeing how thorough the research is for your evalyation of a game used jersey, I’d have to say I’d feel more comfortable collecting jerseys than I would in collecting autographs. Dave Grob is to be commended for his detailed analysis! 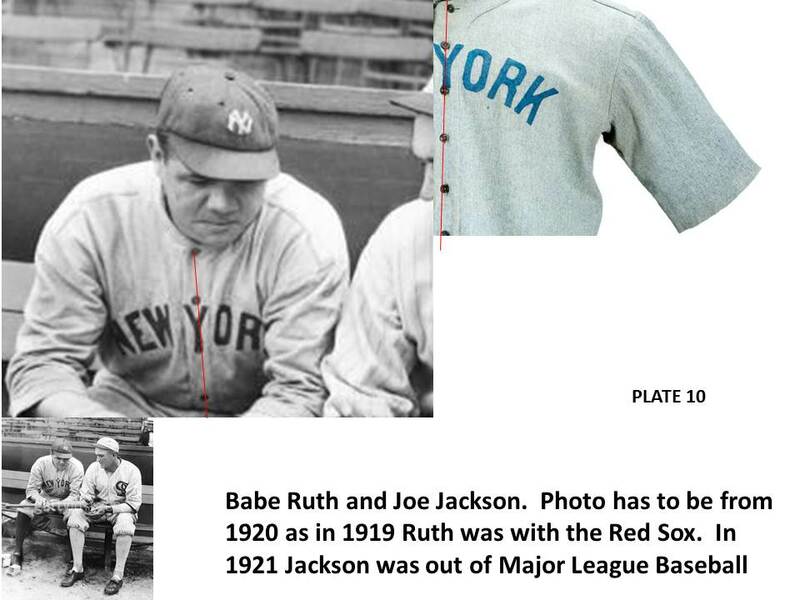 The photo of Babe and Joe Jackson was definitely taken in 1920. We have that photo in the Shoeless Joe Jackson Museum. Joe didn’t get to play the last five games in that season because he was indicted to go before the Grand Jury about the 1919 World Series. Incredibly astounding and so very interesting! It is comforting to know that there is a way to telling the good stuff from the fake. It is a shame that it is so needed. This scientific approach makes me feel better than how some of the PSA/DNA companies approach it, 2 out of 3 opinions makes the decision! Good work Dave and keep up the good work Peter! this is indeed incredible work! 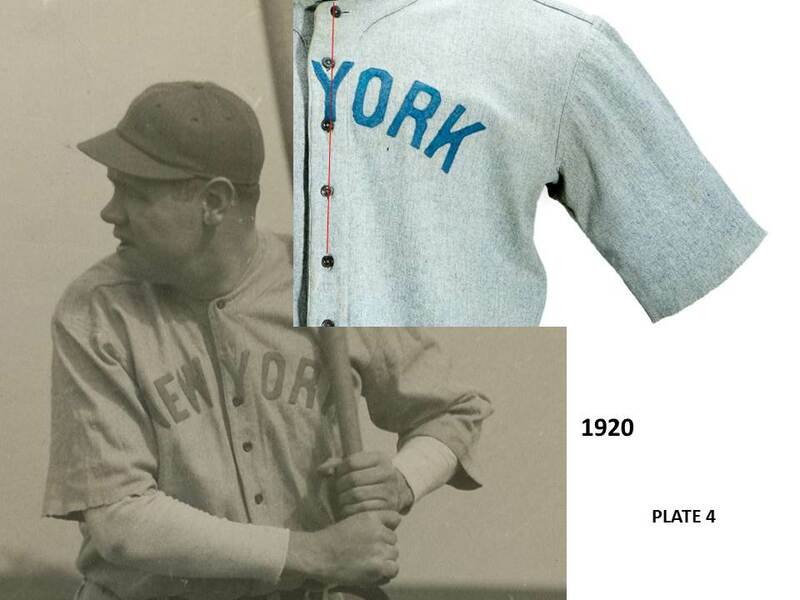 Seems like the only way someone could even attempt to fake a 1920 ruth road jersey would be to get a hold of an authentic post 1920 ruth jersey and move the felt letters into the same position as the 1920. But in that case grob would be able to tell that they were tampered with. If it was another players post 1920 yankee jersey, then the chaun stitched ruth name wiuld have to be added and it seems like grob would be able to identify that too. Is he the only guy out there doing this sort of work? I’ll take Barry Halper’s stories over any scientific analysis any day! I was wondering if you could answer a question for me? What would the Value of the Real Newspaper clipping on Babe Ruth be worth now a days? I was given a whole box of Newspaper stuff from the years of 1900-1930. I have put them in a safe place and was wondering if you could please help me find out. I would be thankful if you would please replay to this letter as soon as you can. Dave, read your article on spalding bat and the lower collector enthusiasm toward them. Nicely done. do you have any info on (The Spalding Premier #157 with a ribbed grip 33 1/2 inch) I cannot find any thing. Maybe a book or two you read that i can research. Titles would be appreciated.